Ergos 50 – multi-functional modular ENT teratment unit, which can be extended with furniture, diagnostic and therapy modules meeting any requirement. 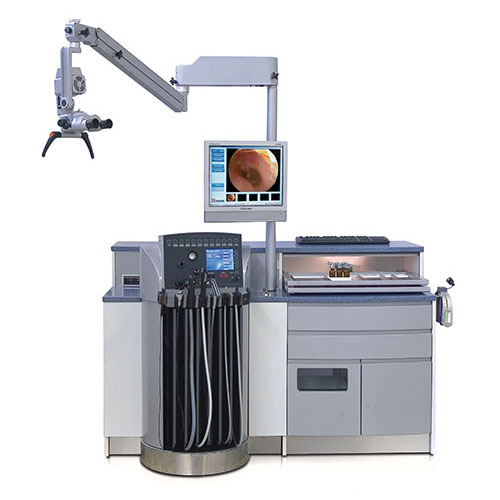 Ergos 50 can include therapy section, instrument module, wall mounts boxes with a built-in negatoscope, sink, writing table for doctor or nurse, monitor, patient chair, physician stool of any chosen color. 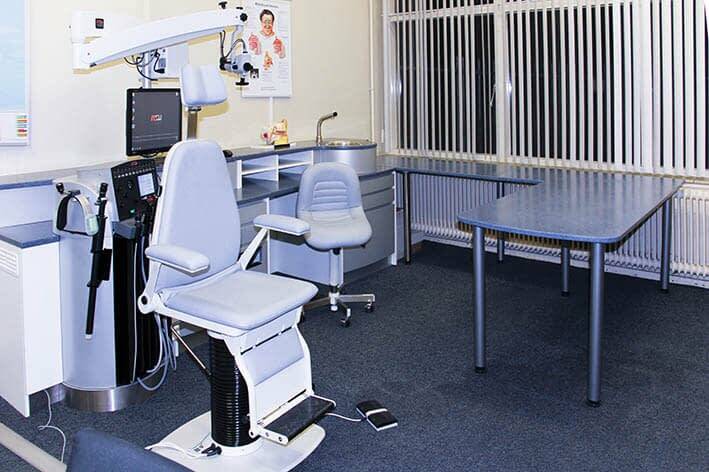 Ergos 50 can include therapy section, instrument module, wall mount drawers with a built-in negatoscope, sink, writing table of doctor or nurse, monitor, patient chair, doctor chair, Chair are aviable in diferent colors. Worktop can be finished with 2 types of material: thermopal (solid synthetic surface) or marlan (synthetic granite marble). all colors are avialable. 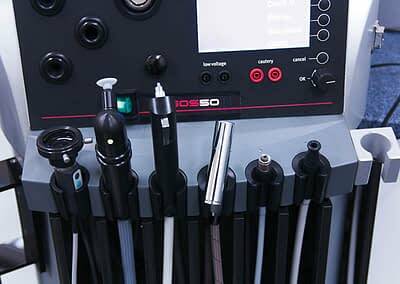 Ergos 50 enables to carry out all necessary studies, this significantly reduces time for making a sustainable diagnosis. 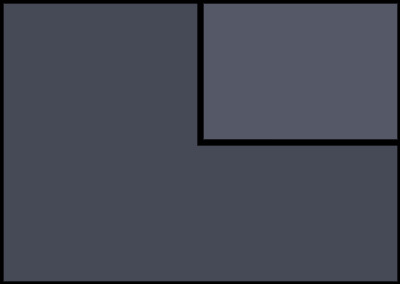 Automatic on/off mode of all the tools for connections or disconnections with a console. Slot location of the hose minimizes the possibility of instruments or devices damage in case of falling over them and also provides the safety of mečdical staff. Therapeutic diagnostic columm turning in any direction guarantees comfortable use. Two level worktop with two reretractable panels for instruments.Two drawers for supplies equipped with special melamin trays. Two containers for waste disposal. The angular design allows to reach all surfaces and tools without additional movements (reduces the probability of professional neck pain). All built-in appliances are mounted on the mobile on the mobile frame accessible for services. 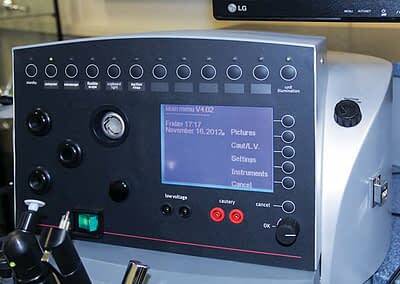 Microprocessor based module with an extra monitor makes Ergos 50 a complete diagnostic center. Hospital network connection (PACS, HIS) via HL7 interface, full DICOM compatibility. Integration trough DVD-writer and USB. Pneumatic gun with compresed air, three tanks for insufflating with liquid and powder medication. 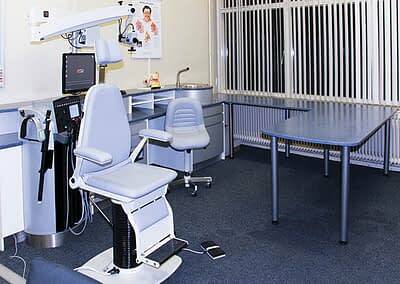 Microscope with a stand, wall mount or columm built in ENT unit. One more halogen and xenon light sources from 150 to 180W. Radiographic device for different types of ENT interface: tonsillectomy, uvulaplastic and neurosurgery providing minimal bleeding of tissue cut. 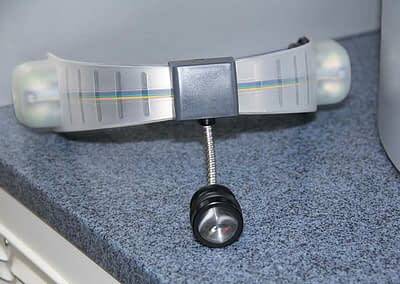 Stroboscope with high power LED for both stroboscopy and ordinary examinations. Immediate heating of the mirrors prevents fogging and provides a clear image. Extra heating capacity up to 60 mirrors. 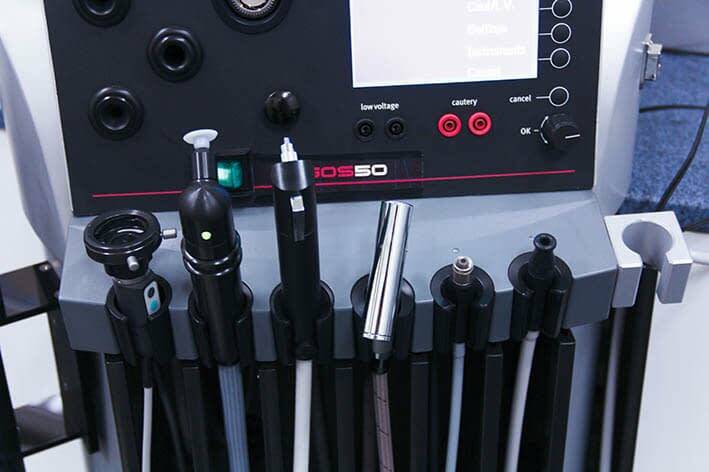 Heated racks, channels for endoscope storage maintain constant temeprature. Control of all Ergos 50 unit functions. 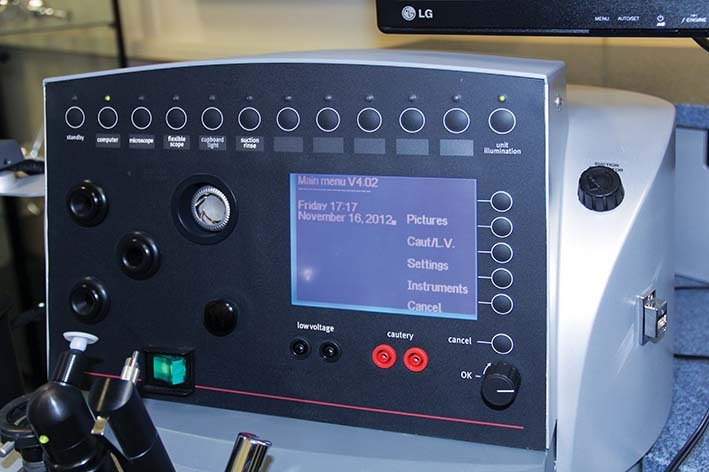 LCD display shows the results of ENT unit work function check, heated water temperature, light bulb change warning, necessity for technical services and work parameters which the physicians uses particular moment. Electronic temperature control of 3 variations (30, 37 and 44 degres C) with indication of required one on LCD display. The heads is equipped with water pressure control buton. Two types of cannulas (straight and curve) available for ear irrigation. Suction pump with sucking capacity of 70l/min with suctionn intensity indication and adjustment options. Automatic system of secretion discharge preventing contamination and objectionable odor. Suction system wash with compressed water. Small steel sink situated on the worktop close to suction pump handle allows to wash heads, suctions cannulas, mirrors and other tools without moving from work place. Halogen lamp provides sufficient light for the procedures. 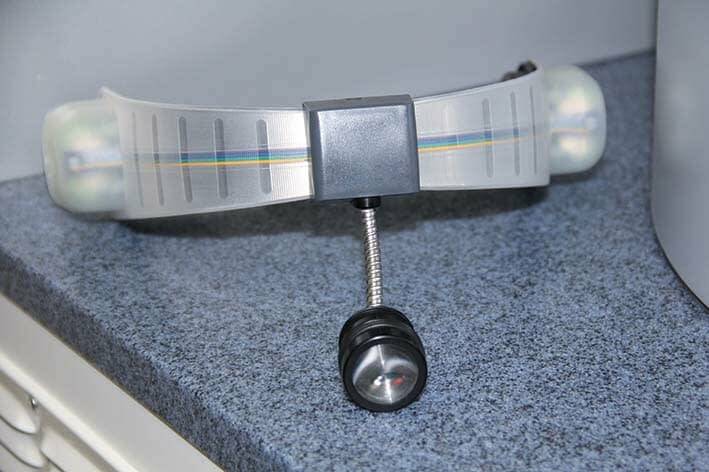 Cable-free compact headlight construction and adjustable headband size provide the long term use. Full battery charge is sufficient for 2+/-0.5 working hours.